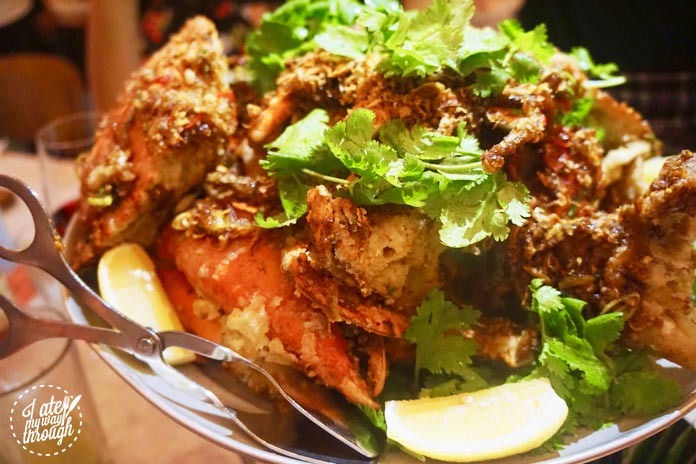 The annual Crab Carnival at The Morrison in Sydney CBD is upon us from March 20 to April 18 and boy, is it worth visiting! 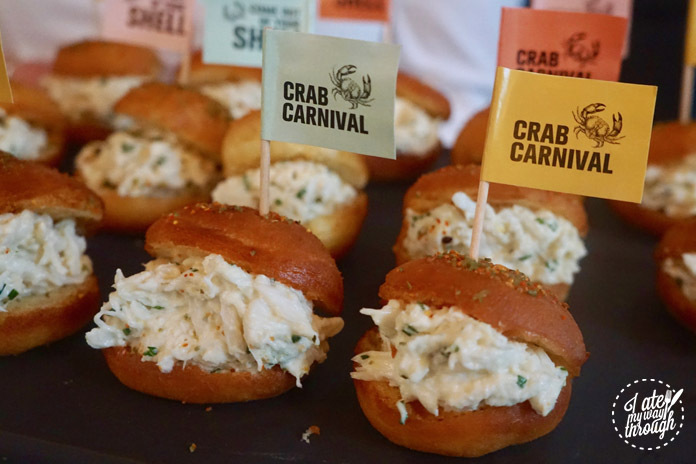 With a self-proclaimed love for seafood, my ears pricked up when I heard about a crab extravaganza with the launch of the 2017 Crab Carnival! 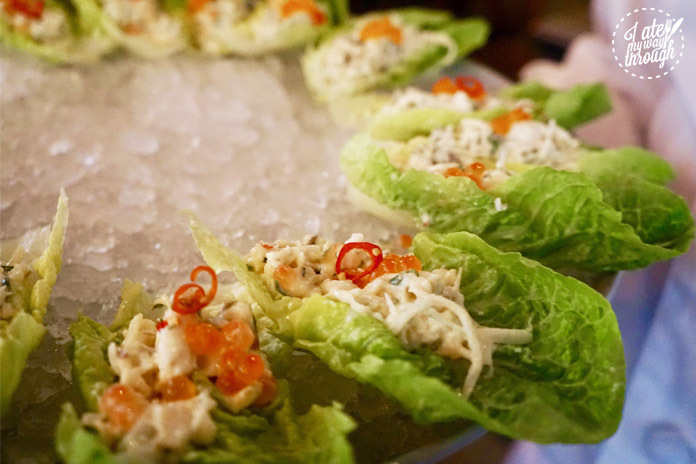 During this month-long festival, The Morrison is featuring a special menu filled with crabby dishes, ranging from cocktails and nibbles to the weekly Louisiana Crab Broil every Thursday. Even if the weather is getting a little cooler and the days are getting shorter, this is definitely worth coming out of your shell for! 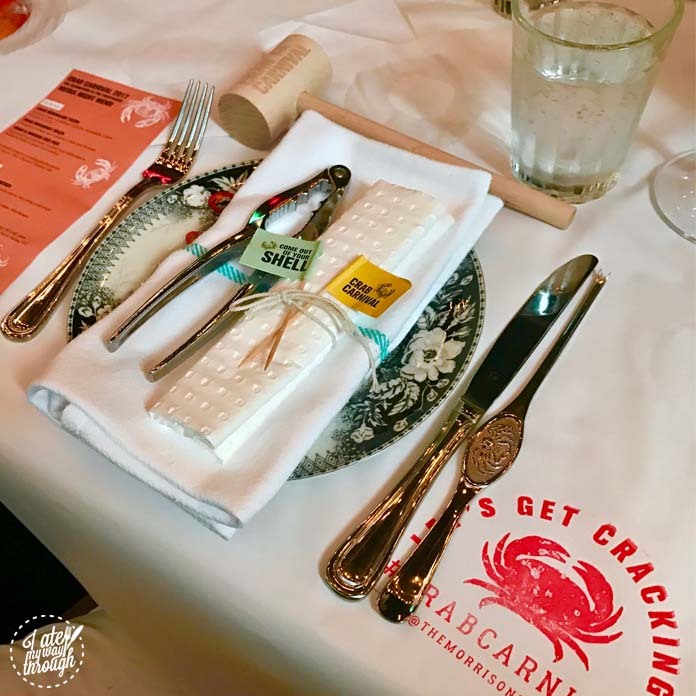 Each place was set with a range of implements and tools to aid us when the crab feast began! 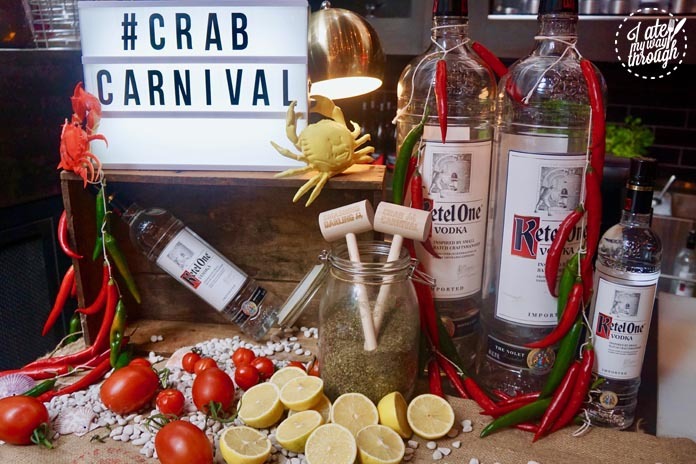 We were lucky enough to be treated to a dinner featuring some of their favourite dishes from the exclusive Crab Carnival menu, as well as some marvellous crab inspired cocktails! 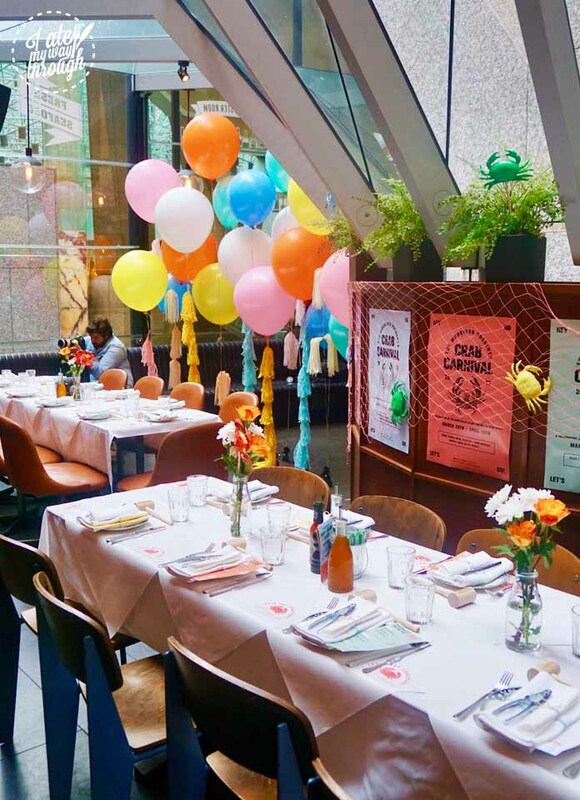 The culinary director Sean Connolly explained he was influenced by his travels to Japan and New York, with the menu drawing on inspiration from around the globe and translated onto the plates of Sydney diners! We started with the Crab doughnut holes (3pc for $16). 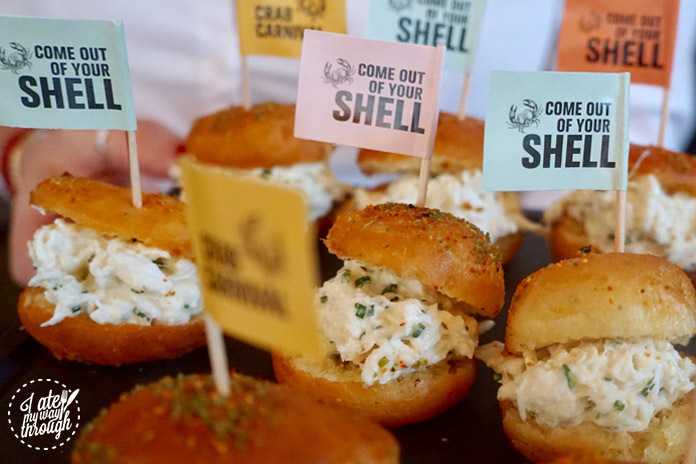 I love doughnuts, and I love crab, so what happens when you combine the two? Blending sweet and savoury can often prove problematic- but this was amazing! These gorgeous little golden puffs of doughnut were the perfect texture to complement the sweet mix of crab and creamy mayo. Not too dense yet not too light, the adorable doughnut played home to the wonderful filling of king crab meat and homemade mayo with a slight sweetness that proved incredibly addictive! For those after something a little healthier, the Crab & Lettuce Tacos (3pc for $18) are a lighter and fresh option, but just as luscious! The Blue Swimmer crab meat in a light mayo, was dressed with chardonnay vinaigrette which harmonised the mixture seamlessly. A sprinkling of salmon caviar sitting atop burst in your mouth with salty squirts. Meanwhile a smidgen of fresh chilli finished it off with an energetic punch! To pair with our entrées, a delightfully tasty Crab-Apple Sangria ($24 for 1L) was circling the crowd. Don’t be fooled by the name as luckily there is no crab in here, but instead a punny play on words inspired by the seasonal variety of the fruit- Crab Apples. A blend of white wine, fresh peach & apple slices, Calvados apple liqueur and tiny bright red pomegranate pearls yielded a refreshing combination to begin the evening. 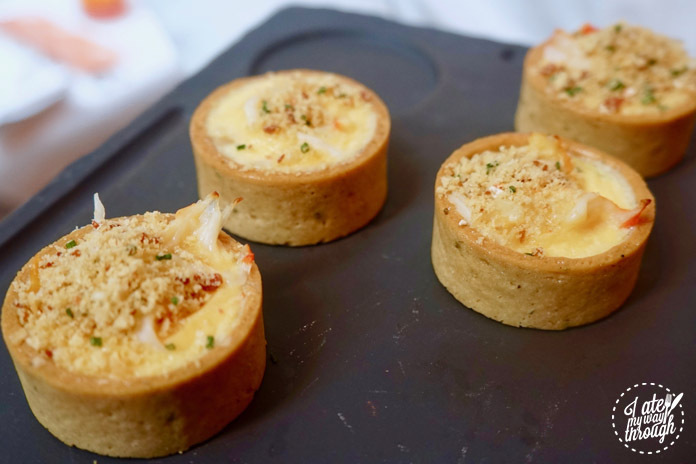 Our last starter was a miniature version of the Open Crab Pie ($34). With an indulgent blend of crab knuckle, smoked cod, white sauce, buttered leeks, the mixture was moist and juicy. The shortcrust pastry was skilfully created yielding a buttery and crumbly result, completed with a little crunch of salty crumbs. A twist on the Bloody Mary with When Crabby Met Mary ($20) was the perfect accompaniment for our bountiful spread of opulent mains. I’m not usually a fan of the drink, but I highly recommend branching out of your comfort zone to sample this, as it was brilliantly balanced and scrumptious! 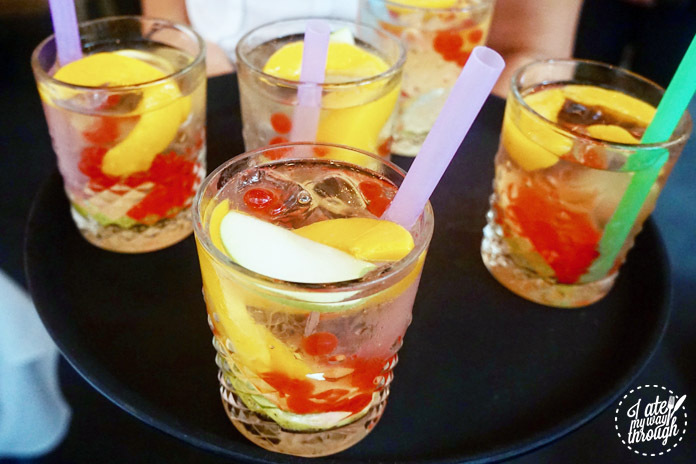 A lip-smacking Bloody Mary mix, alongside Ketel One Vodka, was dressed with an exotic collection of condiments. Pickles, celery, olives and last but not least, a crab leg poked out of the drink emitting playful flair! 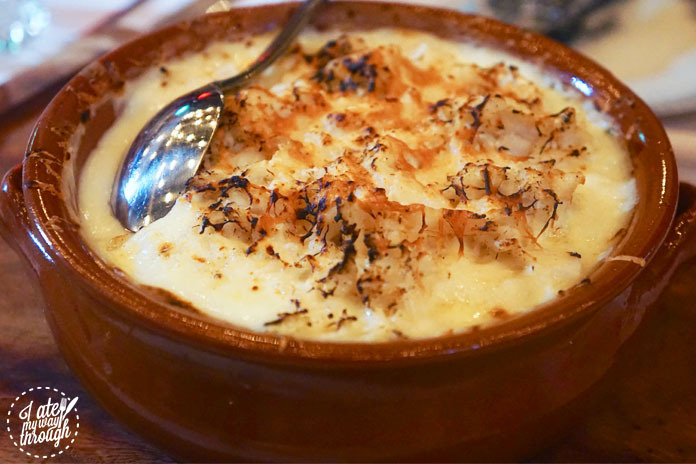 For the main courses we were brought a generous portion of searing hot King Crab Mac & Cheeses ($18). This sizzling dish was delivered to the table emitting a waft of cheesy aroma that proved almost hypnotizing. 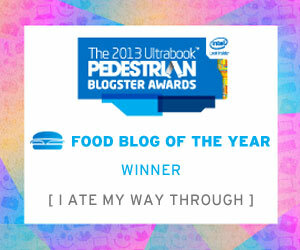 Let me tell you, I am not exaggerating when I say this is the best mac and cheese I have ever eaten! I’m not sure if it was the homemade macaroni pasta which was velvety smooth, the decadent amazing three cheese sauce with its rich creaminess or the addition of torn king crab meat amongst all the cheesy goodness- but this was next level incredible! A golden crust crowned the top thanks to a light grilling before serving, making this dish even more enchanting! The showpiece of the dinner had to be the Typhoon Shelter Muddy ($110) which whilst being an investment, is worth every penny! Grab your bib and be ready to get smashing! 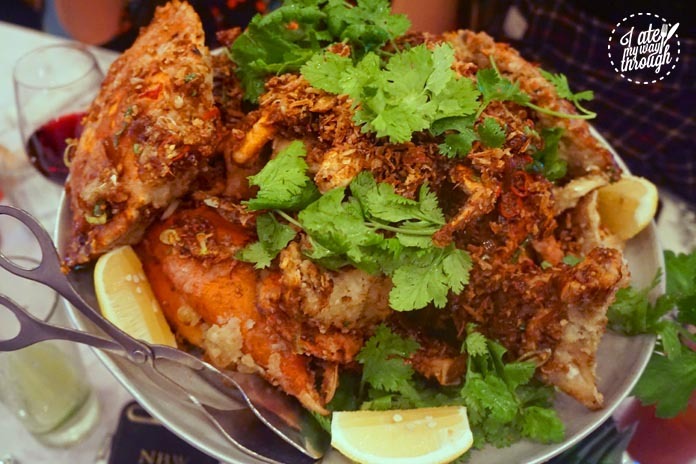 A gigantic platter of crisp fried Mud crab was served alongside an assortment of sautéed chilli, garlic, ginger, blackbean and caramelised onion. A plentiful scattering of coriander added a little fresh greenery to the naughty battered & fried combo! Here we got our hammers, tongs, mallets, and crackers, putting them to good use for attacking the huge orange shells, claws and legs, to rescue every bit of meat we could. The crab got the better of us, and before long we were left all but defeated in a food coma! 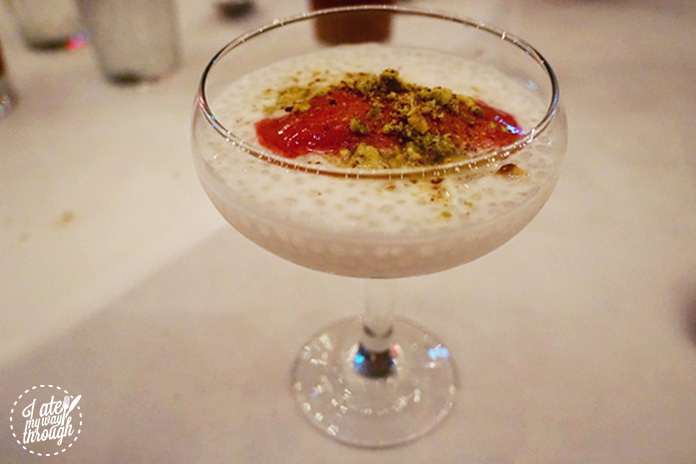 Lucky dessert was a light Coconut Sago ($11). A champagne coupe was home to the cool little beads of coconut marinated sago, with a delicate ruby pink scoop of smooth cherry sorbet. Whilst crushed pistachio dusted it off with a slight crunch! We left stuffed to the brim but somehow, I still want to visit again before the month is out. Something about The Morrison’s crab is just incredibly addictive! 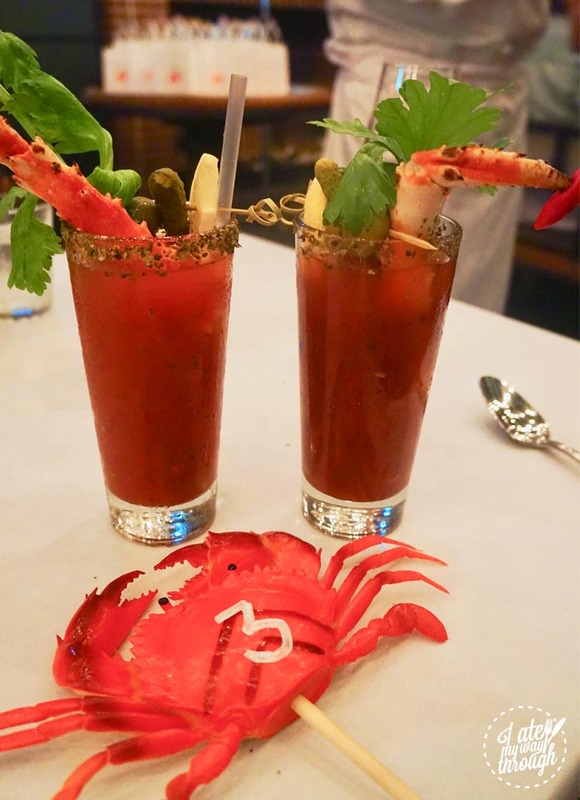 Every Thursday the restaurant will be hosting Crab races and their traditional Louisiana Crab Broil ($55 for 2) filled with blue swimmer crab, old bay spice, corn on the cob, new potato, sausage. Run, not walk to The Morrison or make a booking now, as their steam pot is guaranteed to be cracker! Next articleNespresso – An Ode to Ageing.